Hey Mama! Gosh can you believe we just checked Thanksgiving off our list? Christmas is literally here in our house, LOL we have our tree and lights up! I am pretty excited to dive into the Christmas spirit, like I have been listening to Christmas on our Google Home since November 1st. One of my favorite things about Christmas besides all the sweet family stuff and black boots, is the cocktails. There is something so magical about a good holiday themed cocktail and you don't have to go crazy with a thousand ingredients. I have found that if you stick to fresh ingredients without sweet syrups and over the counter mixes, then you end up with a delicious festive beverage. 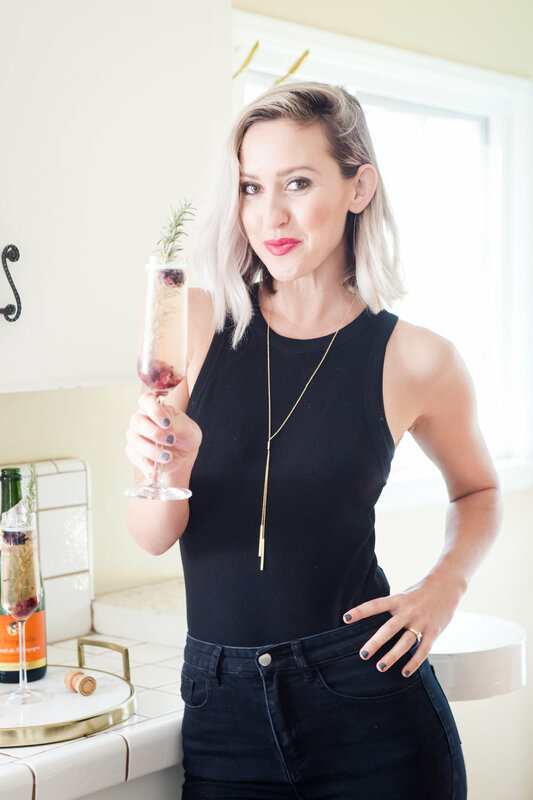 I know that as a mom it's not like we are hosting a ton of fabulous baby free parties where we need an endless supply of cocktail ideas (but I have an amazing bourbon punch recipe here), however it's fun to spice up an at home date night. Stefan and I love to mix it up with our at home date nights and these cocktails are a super fun way to do that. Let's get right into the recipe! In a small bowl muddle 1/2 your cup of blackberries. Then add 1-2 TBSP of mashed blackberries to the bottom of your champagne flute and then fill with champagne. Add 1 sprig of rosemary and 1 fresh blackberry to the glass for garnish. Serve and enjoy!